The Center for Victims of Torture began as a small torture rehabilitation center in America's midwest. Today we are an international organization whose healing, training, research and advocacy initiatives have global impact. 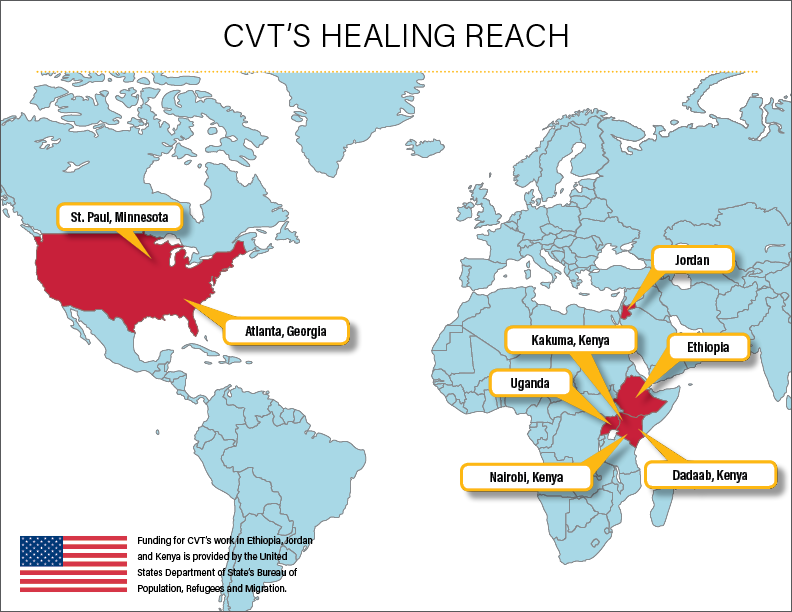 We provide healing to torture survivors in Georgia, Minnesota, Africa and the Middle East. We train partners across the United States and in every region of the world. In Washington D.C., we bring the voice of survivors to America’s capitol. Our work with survivors taught us new ways to advocate for human rights, and we share that learning by promoting tactical innovation and strategic thinking within the international human rights community. Wherever we work, our focus is on helping survivors rebuild lives of dignity, restoring communities, and working for a world in which torture ceases to exist. CVT volunteer Fadia Afashe produced this Arabic language video to provide an understanding of political torture and how and why it is practiced. It provides information for survivors of torture and their families, how they might be affected by the violence they experienced and what they can do to support their healing. The video is based on CVT’s From Terror to Healing video (Part I can be viewed here and Part II here). With Fadia’s generous contribution of countless hours, the information in CVT’s English-language video can now be shared among Arabic speaking communities and nations.